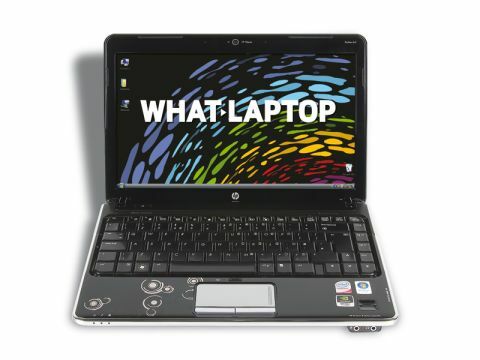 Has HP provided a 13 inch multimedia marvel? HP's Pavilion range represents the company's consumer laptops. Featuring glossy plastics and bold patterning they are highly stylised, but they also boast impressive performance and features which give them a broad appeal. Here we take a look at the Pavilion dv3-2055ea. Constructed from shiny black plastic, both the lid and the palmrest quickly attract dust, dirt and fingerprints. Both also feature HP's Imprint pattern design. While it will appeal to some buyers it will put others off. Build quality is good, however, and should prove sufficiently rugged for the regular traveller. The 13.3-inch Super-TFT screen is bright, detailed and features a widescreen 16:9 aspect ratio, which is ideal for viewing films. Colour reproduction is satisfactory, although not particularly vibrant, and the glossy screen coating produces irritating reflections in bright light. The Nvidia graphics card means light multimedia tasks are possible, so you'll be able to edit your holiday snaps with ease. Despite flexing a little, the keyboard is excellent and provides a firm, competent action, with the smooth, concave keys proving very easy to strike. The shiny touchpad looks great and is also easy to use. It is quite easy to brush while typing, however, so HP has implemented a hotkey alongside it, to lock it when not in use. The HP features the common 2GHz Core 2 Duo but, despite featuring 4096MB of memory, performance didn't prove quite so good. Nevertheless, everyday use was more than acceptable. As a result, you'll have no problem running various office applications at the same time. The 500GB hard drive is more than capable of holding an entire family's files. Comprehensive extra features include the optical drive's LightScribe technology and also a fingerprint scanner, which is great for those who consider the security of their data a priority. The battery life is mightily impressive, providing a fantastic 308 minutes of portable power. Connectivity is equally impressive, with 802.11a/g/n Wi-Fi providing the fastest wireless connections currently possible, and Gigabit Ethernet does the same for fixed connections. Three USB ports are included and an eSATA interface allows the rapid transfer of data to an external HDD. Finally, VGA and HDMI-out ports let you connect analogue and digital monitors. The Pavilion dv3-2055ea impresses in nearly every way and if you like the design then this laptop makes a very tempting proposition.